Q. I just got a new iPhone and have noticed that every time I pick it up or move it, the screen pops on by itself instead of me turning it on with the switch. Is this a problem with the phone? A. The iPhone 6s and later models include a feature called Raise to Wake that senses when you pick up the device and then automatically flips on the display screen — so you do not have to fumble around with the Home or power buttons when you want to check something. If you have just purchased a new iPhone or had not upgraded your hardware in a few years, the sudden activity can seem a little unsettling. Raise to Wake also saves you a step if you need to snap a photo in a hurry because as you lift the phone, you can swipe the screen to the left to quickly jump to the iPhone’s Camera app. Swiping up from the bottom of the screen summons the iOS Control Center, where you can change the music volume, use the iPhone’s flashlight, switch on Airplane Mode and adjust other settings without having to unlock the phone and fiddle around in the main Settings app. 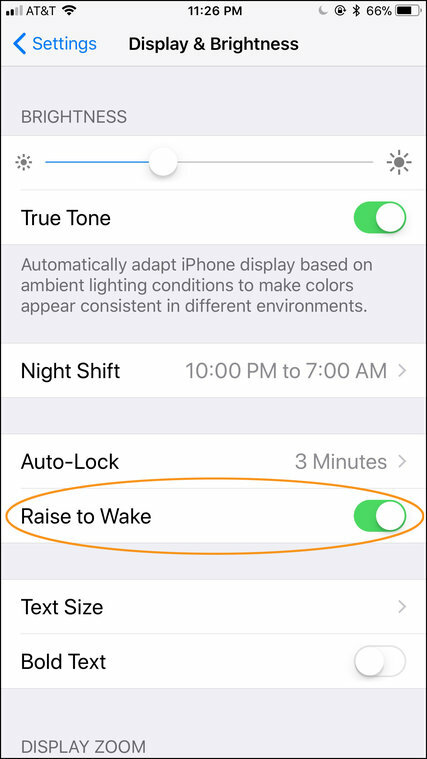 If you don’t want the iPhone’s screen popping on every time you pick up the device, you can turn off the “Raise to Wake” feature in the iOS Display & Brightness settings. If you do not want your notifications visible to people nearby or worry your phone’s battery is taking too much of a hit when the screen pops on each time you move the device, you can turn off “Raise to Wake.” To do that, unlock your iPhone, tap the Settings app on the Home screen, select Display & Brightness and tap the button near Raise to Wake to disable the feature.